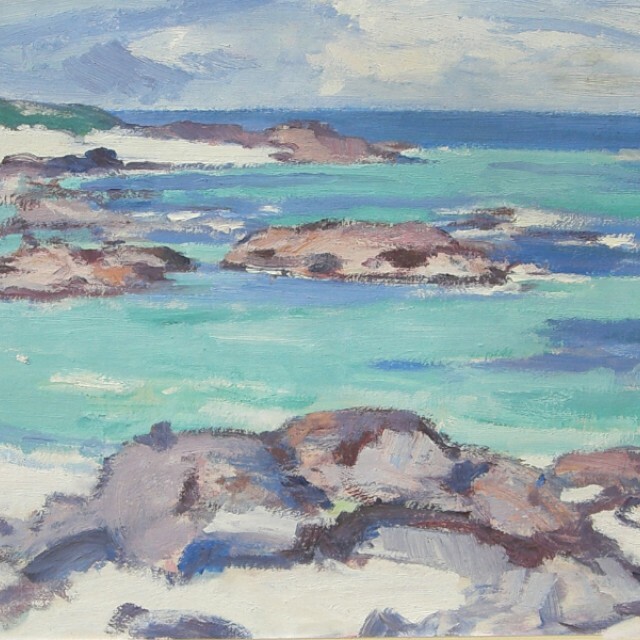 Samuel John Peploe (1871-1935) was the eldest and most successful of the four artists popularly known as The Scottish Colourists, along with FCB Cadell, JD Fergusson and GL Hunter. Peploe is considered by many to be the leader of the group and indeed it was his friendship with the others which bound the four together. Born in Edinburgh, Peploe lived in the Scottish capital all his life, apart from two years spent in Paris between 1910 and 1912. Most celebrated for his beautiful still lifes, Peploe depicted a selection of props, including roses, tulips and coffee pots, placed in an infinite variety of combinations and lovingly painted in his studio. The care which Peploe lavished on his still lifes contrasts with the more spontaneous technique with which he created his stunning French and Scottish landscapes, painted en plein air from 1896. At certain periods Peploe also painted figure studies of beauty and significance, including images of his wife and their two sons.